Exchange Server is being a secure virtual postbox, which enables the user to communicate more effectively using emails. Amongst all file formats, Exchange Server has their own .edb file for storing the data. In simple terms, this file format maintains the crucial data of the user that has already shared with a client on the other side. Even it may be emails and many other items related to it. In this article, we read about dirty shutdown state in Exchange Server. Exchange database files (EDB) are secure and reliable for holding the data further, they can generally be accessed at any time and from anywhere as per user satisfaction. As one cannot deny the occurrence of corruption. Just a little difference, when compared with another case of corruption the reason is that the corruption level is quite high due to many factors of corruption, including registry error, JET errors, Exchange error message, and dirty shutdown state. The most prominent factor of Exchange .edb file corruption is the system shutdown(dirty). Therefore, due to the above reasons, there is a notification that comes up with EDB files to bring the data corruption. Thus, keeping users .edb files safe and secure it is really important to save those EDB files. However, in the following section, we are going to discuss possible reasons that lead to dirty system shutdown and its solution. To understand the genealogy of dirty system shutdown users must have to know the complete working of Exchange Server. To convey the required data it is essential that such as information should be attached to a database. Once the detail has been processed, its entry is made up of several log files. Thus, it is more clear that log file keeps a record of input as well as output of transaction information or a transaction log. The log files are extremely important as they have also the source to know whether the concerned data files need an earlier version of the database or not. This is quite important because sometimes user may remove the required files and required to re-open it again with the same version of a database. As users may encounter Exchange dirty shutdown state error, it’s quite obvious that the concerned data also saved in EDB files which are not accessible and must take an immediate action to safeguard those files appropriately. For doing this, users have to take assistance from the third-party utility named as Exchange Server Recovery. This tool has been designed to retrieve the contents of emails, tasks, contacts, journals, calendar items, notes, etc. from corrupt EDB files. Thus, the entire process has been perfectly accomplished without any kind of delay. To have a glance over the data from damaged EDB files successfully, Exchange Server Recovery tool also provides the ‘Preview’ option. Moreover, the software retains the integrity of data throughout the process. It means that during the overall process, Exchange Server Recovery software maintaining the .edb file structure and hierarchy as well. Exchange Server Recovery tool has built-in three recovery modes i.e. Automatic Analyze & Recover, Advance Scan and Rebuild Corrupt Databases. The selection of recovery mode relies on severely corrupted EDB files. Automatic Analyze & Recover Mode: Being the fastest mode among three, Automatic Analyze and Recover Mode helps to repair the corrupt EDB files and convert them into PST file. Advance Scan Mode: It is a medium scanning mode, which ensures the best recovery from severely corrupt or damaged EDB files. Rebuild Corrupt Databases: In simple, this mode permits to restore the corrupt EDB files and such data might be easily synchronized with Microsoft Exchange Server. It is astonishing that EDB database, which sometimes thought, beyond the state of recovery has perfectly recovered with the help of this software. It is possible only because of a powerful inbuilt algorithm can take care of the whole process without using any loops. Transaction log files play an important role in the smooth working of an Exchange database server. It allows a user to communicate more effectively through emails. Along with, we have discussed the role of transaction log files, reasons due to which corruption occurs and its resolution to fix the dirty shutdown state error as well. 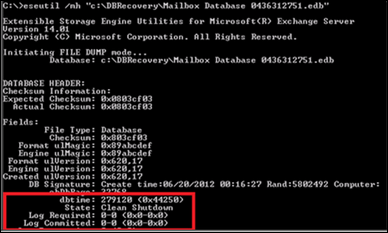 Also, Exchange Server Recovery Software has been discussed to recover the corrupted .edb files.